2-WIRE SPM-2300 Series Surveillance Style, Lapel Mic Kit with Noise Reduction Mic on seperate 36" cable (allowing Mic & PTT to be conveniently and discreetly located). 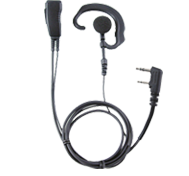 ADJUSTABLE EARPIECE SPM-1200C Series - Lapel Microphone: Lapel Microphone with C-ring style earphone. 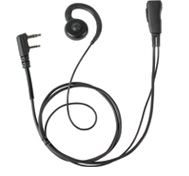 MIRAGE™ Series - SPM-1300 - Surveillance Kit , Lapel Mic Style (1-wire) with Noise Reducing Mic element and Clear Tube Earphone..